Because the observance of the birthday of Dr. Martin Luther King, Jr. (one of my earliest heroes) is this weekend, I wanted to choose a book for this Perfect Picture Book Friday that would honor that, while still featuring some connection to the arts, which is the broader theme of my work and my blog. Since so many musicians (and writers, actors, and others involved in the arts) were a part of the American civil rights movement, I didn’t have to look far. This book pays warm tribute to many of the men (yes, there are solely men highlighted in the book) who played a part in this era in history. Publisher: New York: Simon & Schuster Books for Young Children, 1983, 2004. Synopsis: Through the simple words of the poem (that predated the picture book by 21 years) and the richly drawn illustrations, African-American musicians such as Duke Ellington, Dizzy Gillespie and Paul Robeson, writers such as W.E.B. Du Bois, political leaders such as Kwame Nkrumah, and others come to life. The poem and illustrations together tell of the childhood of the poet, who grew up in a house where civil rights work and music were as much the stuff of life as eating and breathing. Activities/Resources: Resources for all Coretta Scott King award winning books can be found at Teaching Books . 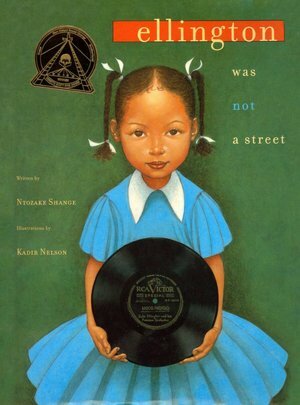 Hear the illustrator, Kadir Nelson, speak about this book here. A PDF guide to the book, and an audio reading by Phylicia Rashad can be found here. A transcript of an interview with the illustrator is available at Reading Rockets website. There are, of course, many resources available for the wider study of the African-American civil rights movement and the people who were involved, including resources for the observance of Martin Luther King Jr. Day of Service. # 9 in Perfect Picture Book Fridays. See all this week’s Perfect Picture Books at Susanna Leonard Hill’s blog, or find the entire listing at the “Perfect Picture Books” tab on her blog. I love the poem and the idea of introducing these celebrated names through their visiting this little girl’s home. Lovely book, Beth, celebrating the arts and equality. What a wonderful amount of resources you found to delight any teacher’s heart! This book really struck a chord with me, since so many of those names represent people I have admired for a long time. To be able to imagine the richness of experience that child had was wonderful. It’s a book that lends itself to many teaching opportunities. Thanks, Joanna! In looking at history it is so important to include what was going in the arts, the heart of culture. None of my history classes included anything other than political history until I went to art school, which is a shame! This book sounds wonderful and I will be looking for it to read to my boys as we listen to some great jazz and big band music. Thanks for the excellent review! Thank you, Heather. When I think about it, your comment is true for my history classes as well. I was fortunate that for one year, Grade Nine, we had a drama class in which we learned some theatre history. That, I think, gave me a better understanding of the lives of real people than the history classes about kings and rulers and battles. I’m delighted to hear that you encourage your boys to listen to jazz and big band music! When I was a child, I used to fall asleep to records of musicals and big bands. Wonderful stuff! I love the idea of showing famous people as just the ordinary folks they are (or were). It’s especially important in the celebrity-crazed environment we live in right now. Great choice! Thanks, Julie. This book shows people as ordinary people, yet the writer is always aware that they are luminaries. So they’re shown as luminaries, as great people, but not as celebrities — if that makes any sense! What a lovely choice of books for MLK Day. I love how the music of these great African-American musicians, as seen through the eyes of the child. They seem so ordinary with huge talent. Julie is right, we’ve become too focused on being the next “idol,” whether talent is there. I also loved the poem. What a treasure! Thank you so much for sharing. I just love special finds like this. Thanks, Pat. That’s just the first verse of the poem, it continues throughout the book. Paul Robeson is a hero of mine. I want to read this book. Thanks. Paul Robeson is a hero of mine. I want to read this book. Thanks. I just blogged the first page oaf a picture book about Willie Mays in December. Thanks for visiting, Pen and Ink! Paul Robeson was an amazing man. I love the way he changed one line of “Old Man River” to “we must keep fighting until we’re dying”. I will look for your Willie Mays post! Thanks, Natalie! I haven’t read “Before John Was a Jazz Giant” — I’ll have to re-read your PPB post on it, and see if my library has it. It sounds right up my alley! Thank you, Susanna! Note that it’s not just musicians, but other civil rights activists, and even the man who was president of Ghana at the time! What a perfect picture book to present this week! My husband took a Jazz class last year, and we watched Ken Burn’s Jazz documentary series with him. It was wonderful! Now whenever I am a bit stressed, I put on some Jazz and it calms me. I think it is really cool that there are picture books out there like this that introduce children to the Civil Rights movement. It is a very important part of our past that needs to be remembered and honored. I love the idea of this book and will look it for the next time I stop by the library.Thank you for introducing it to us! Thanks, Loni. Have you encountered recordings of the Canadian jazz great, Oscar Peterson? I love the way that man played the piano! Oh, and thinking about him just made me realize something I need to post for MLK Day! Thanks for inadvertently sparking that thought! I think you’ll love the artwork in this book, too, Loni. Hope you find it in your library! What a cool book! I like to learn about history and I haven’t heard of some of these people. I’ll have to check it out (literally…from the library)! Erik, I think you’ll enjoy it very much. There’s a bit of information at the back of the book about some of the people featured in the story, which might prompt you to learn even more about them. Oh good! I’m so glad to have helped you, Angela! I like your perfect timing to review this book. Love the poetry. You’re welcome! Hope you and the kids like the book. And thank you for the compliment on the site! There’s still some tweaking to do, but I’m happy with the things I can do here that I couldn’t with the old one. Wonderful, Brenda! I’m so glad the review and resources were helpful for you.